During a year full of some of the best big-budget spectacle movies that has come along in while, Steven Spielberg decides to deliver one of the year’s more subdued, big-budget dramas. Set against the Cold War of the early 60s, Bridge of Spies tells the story of an American lawyer hired by the U.S. government to broker a deal for a trade of spies with the Russians. It’s a story ripe with perfect Spielberg fodder, minus the spectacle. Focusing heavily on characters inside a morality tale, we have a film recalling the now dubbed “classic” era of movies, where directors like Howard Hawkes and John Ford made sprawling epics that could feel intimate while also teaching a lesson in ethics. Big in scope, small in feel, Spielberg has crafted a technically proficient and perfectly safe story about how we should all treat each other. 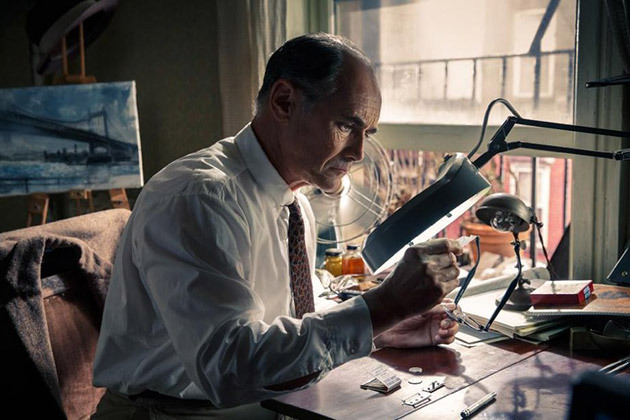 The movie opens on a Russian spy named Colonel Rudolf Abel (Mark Rylance) being tracked by the U.S. government, and ultimately caught. Because we live in a country of democracy, it’s decided that Abel should get a fair (read staged) trial to prove just that. Lawyer James Donovan (Tom Hanks) is tapped to be the one to defend Abel. Being the moral center, Donovan decides Abel deserves the best defense he can provide, much to the chagrin of all of the U.S.A. Meanwhile a new U.S. spy program involving the experimental U2 plane leaves a pilot in Russian hands. It’s decided a deal should be brokered to arrange an exchange of the U2 pilot, Francis Gary Powers (Austin Stowell) for Colonel Abel and that Donovan should be the one to do so. This sends Donovan to Berlin, just as the Wall is being constructed, for most of the film’s duration. More of a procedural than anything else, the film mostly follows Donovan as he works through the means at his disposal to broker the deal he believes should take place. Complicating things is a second U.S. citizen who is caught at the same time as Powers. Donovan wants both Americans in exchange for Abel, but must contend with the Russian government as well as the German Democratic Republic and his own government, which only cares about Powers. While the script was re-written by Joel and Ethan Coen, it’s still clearly a Spielberg story, complete with emotional music cues designed not to express character emotions, but the emotions that you, the audience, are supposed to feel. While all movies are a matter of manipulation, Spielberg is the kind of manipulator that doesn’t mind telling you that’s what he’s doing. Personally, I like to be manipulated without outright recognizing it. Depending on what works for you will depend on how this movie is received. Expertly delivered, large, elaborate sets full of extras and countless moving parts showcase a film maker who can craft like no other. Unfortunately so much of what’s being delivered here is designed to make sure its audience is not lost at any time. For a story set against the turmoil of a city divided in the wake of a war, there’s nothing really dangerous about it. Even when Donovan encounters a gang of teens wanting his jacket, there never seems to be any tension or fear that the final result won’t be a bow neatly tied. For all its showmanship, deftly delivered camera movements among perfectly lit sets, and the Coen’s snappy dialog, there’s not much depth outside aspects of history, worth mining. 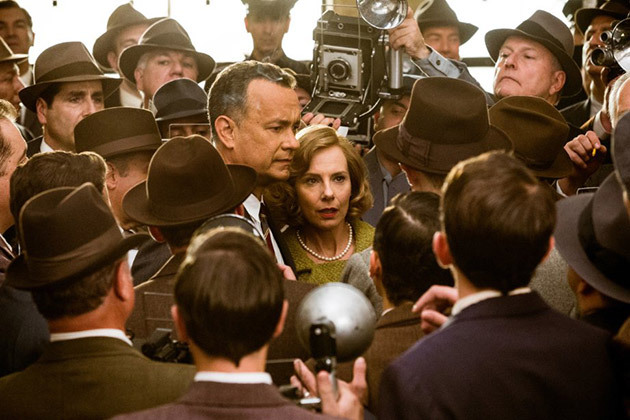 Tom Hanks delivers the kind of performance that’s remindful of how some people can make it look so easy. He saunters in with insurance lawyer hyperbole, shifts facial expressions from salesman to concerned father and delivers lines like he had them memorized years ago. For all the hammy things Hanks has done in the latter years of his career, he didn’t get there by bribing some casting agents. Mark Rylance holds his own opposite Hanks, but with sugar-sweet lines centering around a lack of worrying and puppy dog looks designed for sympathy, it’s hard, again, not to see past the obvious manipulation. However, for all its overt attempt at being a great movie, it can’t be overstated the importance of morality tales, especially in this “post” millennial era where discrimination is dangerously perceived as being less existent. The message here may simply be, we’re all human, and therefore we should all have a sympathetic connection, but it’s one that really can’t be repeated enough. Ultimately this is a mixed bag, where one side really doesn’t need to outweigh the other. Different movies are made for different reasons. And while Spielberg may not be interested in subtlety in storytelling, he’s at least telling stories that should be told.